Richard Sherman spent seven years tormenting the San Francisco 49ers with his lockdown coverage, colorful trash talk and celebratory turkey eating at midfield. The former Stanford star has returned to the Bay Area since he wanted to stay on the West Coast to be close to his parents in Los Angeles and his soon-to-be wife's family in Seattle. Sherman, who turns 30 later this month, is coming off an Achilles tendon injury that cost him half of the 2017 season. Sherman also had a cleanup surgery on his opposite ankle during the offseason. That led to Seattle's decision that he wasn't worth his $13 million salary for 2018. The following season Sherman celebrated a Thanksgiving night win at Levi's Stadium by eating a turkey leg at midfield, although he said that was prompted by NBC producers who told him to ``eat the turkey'' during the interview. 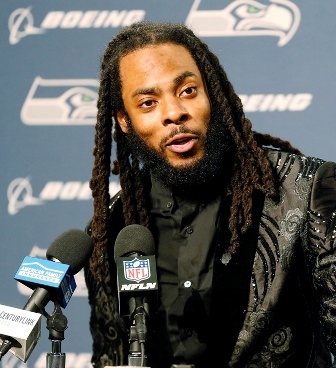 Sherman, who negotiated his own contract, described the few days after being released by Seattle as ``chaos.'' He was at the NFLPA meetings in Las Vegas when the Seahawks gave him the news and he heard from 49ers general manager John Lynch and coach Kyle Shanahan almost as soon as the transaction hit the waiver wire.